Whoa! Yeah, I'd call that progress :). Looking amazing! The poly is going down as we speak! I read the previous post, but I'm still confused. What is the yellow stuff for? 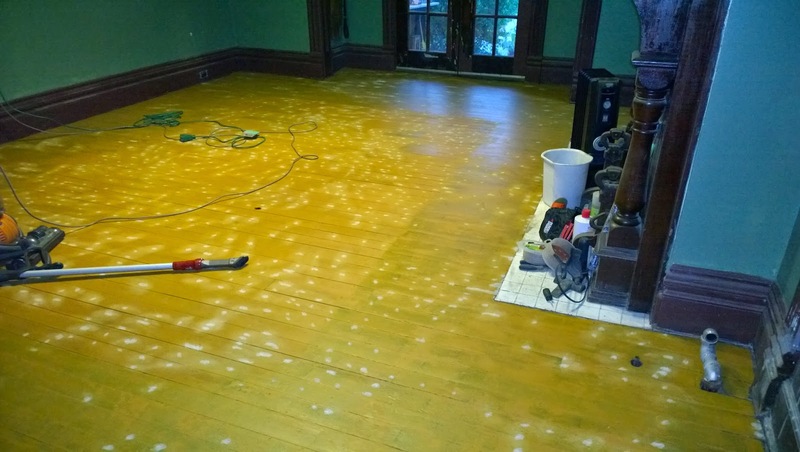 And how did you get nice hardwood after putting on the yellow stuff? I know absolutely nothing about these things, so forgive my ignorance. It looks amazing though!!! No worries Tiffaney - what I'm doing is a faux finish technique that was quite common until about 1890. 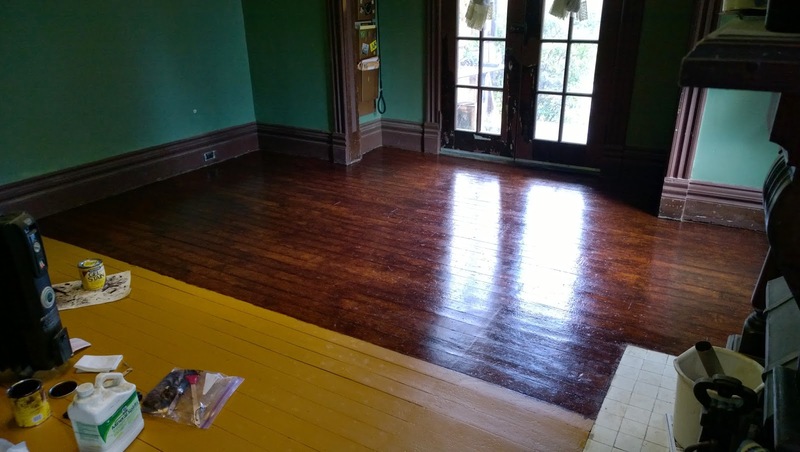 You paint a base coat of color on the floor to match the lightest tone of the wood you're imitating, and then use a glaze on top of that to paint on the "grain" of the wood. I'll talk about it more the next time I post. Oh wow, I didn't know such a thing existed! If I understand correctly, you're still seeing the actual grain of the wood? Not entirely "faux" then, which is nice. It really looks great though, my goodness. You did a super job. Whoa! That's terribly interesting. I had no idea. I will keep it in mind though, because my husband and I are looking for an old house to buy an fix up. I might need to use this! Oh . Em . Geeeeee!!!!!! You are making SUPER progress. I'll bet it feels great to sit back and look across that beautiful expanse of faux bois!